I have to say, I love cars. A good Maloo on display at the Deni Ute Muster does it for me. There’s something cool about sleek curves and a throttling engine. Today my machine and I are out in the paddock doing some clearing. 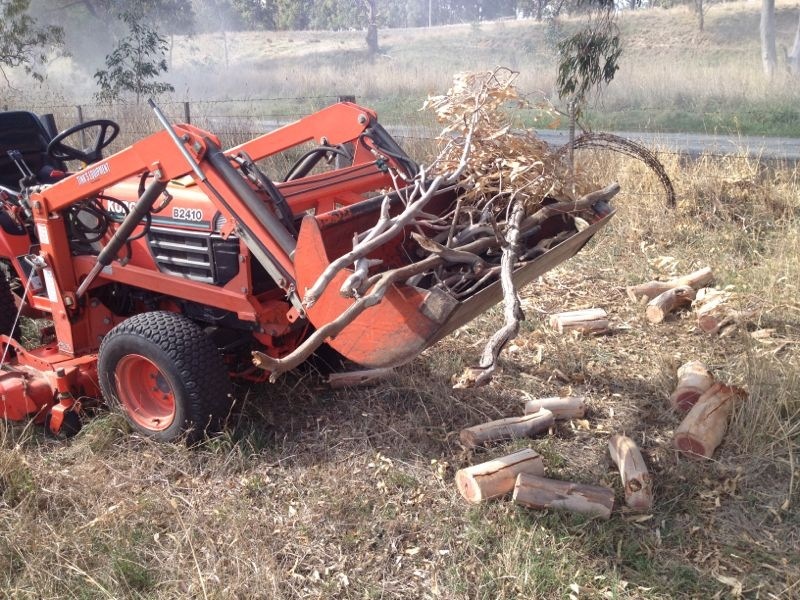 Small and compact, this little Kubota works a treat when it comes to getting stuff done. 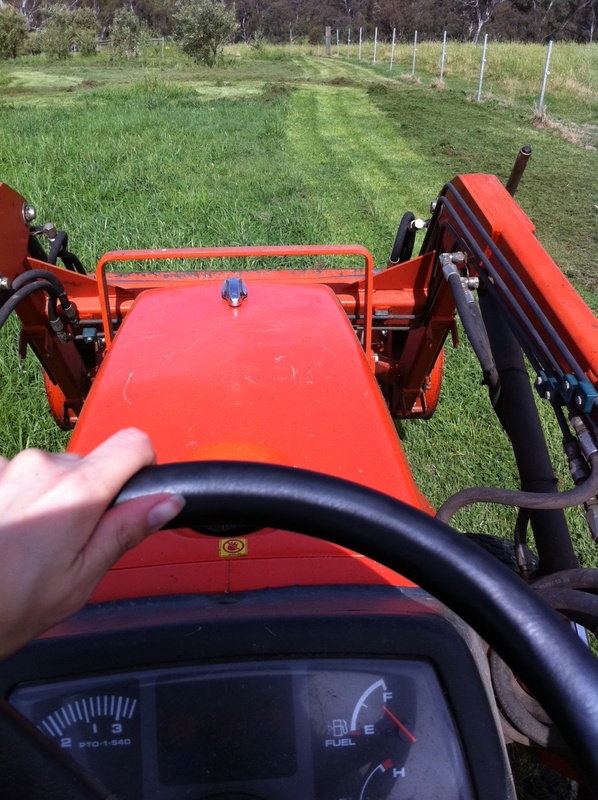 Mowing, pushing and digging, this orange pocket rocket is my friend. Give me a boys toy any day. Gorgeous homewares brand Neapolitan used Mulberry Tree Farm as the inspiration for their recent photo shot. Check out a few behind the scenes images. We promise to show you the final images when they are done. Follow the link to the Neapolitan Facebook Album : (1) Neapolitanphoto shoot…sneak peaks. It was an accident. We were looking to buy a house in the metro area and felt very discouraged by the very high prices being charged for very ordinary properties. I spied an ad for a picture-perfect country pad an hour and a half away from the city and casually showed it to my husband. Land-locked in deep hill country, it was the perfect antithesis of the beach house that my surfie dude hubby had been telling me he one day wanted to own. Driving out to the weekend open for inspection with my mum, dad and nan in tow, my hubby remarked how far away it was. But stepping out of the car for a comfort stop in the nearest town, he remarked how fresh the air was. I nodded enthusiastically. Anything positive at this stage was good. We continued on through an impressive road cutting, down towards the white pebble driveway that the agent had assured us we would not miss. Thanks to the massive FOR AUCTION sign at the front we turned right and meandered along past the wattle trees bordering the circular driveway. A rose-covered arch signalled the garden path, and up it we were led. I was blown away. The cottage was a picture, the garden glorious and my family petrified. My hubby was very impressed and the agent was ecstatic. Into the cottage we went. It was too good to be true. Sympathetically funkified by Australia’s doyenne of design, Janne Faulkner, we started placing our furniture around the rooms. We were spoilt for choice with views too – garden guru Paul Bangay had completed the design. And, to top it off, there was a kitchen larder. A genuine, real McCoy larder. I was in love. We were overseas on auction day, so Mum, Dad and Nan headed up to act as buyer’s advocates. The only way we had reception was with my hubby hanging his torso off the end of the hotel room bed. I was sitting demurely beside him. Fast forward 97 bids with an infuriating opponent adding “and a half” to every bid we put in: Hubby hanging his torso off the end of the hotel room bed, me jumping on the bed pouring expletives asking as to what was going on. But my hubby and Dad had it all under control. In less than 10 minutes, we were the proud custodians of Mulberry Tree Farm. Nan was a hit with the auctioneer who came and congratulated her upon her son’s property acquirement. Mum and Dad quickly explained that they were acting on our behalf, and soon rumours were rife that a wealthy Silver Fox had bought a farm for his young newly wed son. The locals couldn’t wait to meet the Silver Spooners. Three months after auction day we, the middle age couple, rocked up to get our keys. In a sports car. Hubby wore bright red loafers. I sported Coach sunglasses. The rumours went wild. What on earth were these two thinking? As we took the keys I wondered the same thing. What WERE we doing? And that’s where it all started.